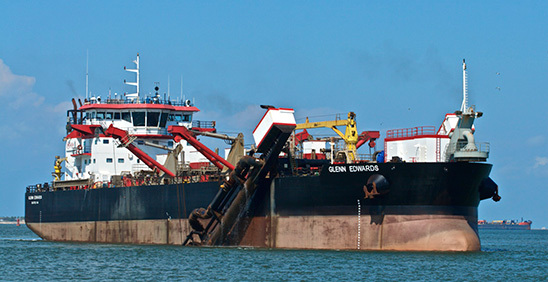 The Glenn Edwards is part of the Manson fleet of hopper dredge vessels and is the largest capacity trailing suction hopper dredge in the United States. Dredge vessels offer channel and harbor maintenance as well as upland disposal and beach nourishment. The Glenn Edwards stores just over 10,000 cubic meters of dredged material in hoppers to transport to disposal sites, or can disperse the material directly through discharge outlets. For operations to be economical, speed and maneuverability are essential for a dredge vessel. Speed will dictate how many runs the vessel can make and how efficiently it can complete a run. To accommodate a necessary speed of 12 knots while loaded and 14 while empty, Manson originally specified Schottel 1,920 kW azimuthing Z drive units fitted with nozzles, and a bowthruster, for easy maneuvering in ports. As the project progressed, it became apparent that the Schottel units could not meet the owner’s speed requirements without modifications. Manson, a long-time customer with several Nautican vessels in their fleet, was very familiar with the performance of the Nautican high-performance nozzles and approached Nautican to see if the company could offer a solution. Before the vessel was delivered, the decision was made to retrofit the Schottel units with Nautican high efficiency nozzles and propellers. Nautican designed a specialized unit without pre-swirl stators, which integrated seamlessly with the Schottel drive unit. Nautican delivered four 2,600mm high-efficiency nozzles and propellers to Manson in 2005. Since the retrofit with Nautican units, the vessel has consistently achieved 12.5 knots while loaded and 14.5 when light, exceeding expectations and assisting in the efficiency and value of the Glenn Edwards operations.